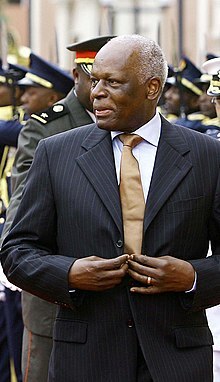 José Eduardo dos Santos (born 28 August 1942) is an Angolan politeecian who wis Preses o Angola frae 1979 tae 2017. As Preses, José Eduardo dos Santos wis an aa the commander in chief o the Angolan Airmed Forces (FAA) an preses o the Fowk's Movement for the Liberation o Angola (MPLA), the pairty that has ruled Angola syne it gained unthirldom in 1975. ↑ Poseetion abolished in 2010. ↑ José Eduardo dos Santos: Biography from. Answers.com. Retrieved on 9 January 2011. This page wis last eeditit on 31 August 2018, at 02:24.